Right-wing media enabled Donald Trump's political rise. Now it's taking a lead role in his presidential campaign. On Wednesday, Trump announced he has hired Steve Bannon, the executive chairman of Breitbart News, to serve as CEO of his campaign. The appointment came less than 24 hours after it was revealed that ousted Fox News chief Roger Ailes has been privately giving Trump advice for the forthcoming presidential debates. For many political observers, Bannon and Ailes' influence over the Republican presidential nominee epitomizes right-wing media's influence over the Grand Old Party. It also highlights the degree to which Trump, a media-conscious reality television star, seems more preoccupied with courting the conservative audience he already has than expanding his political base in order to win the election. Trump's presidential campaign has been fueled by a conservative media echo-chamber that came to fruition in the 1990s with the Drudge Report, right-wing talk radio and Fox News, and which has expanded in recent years with digital platforms like Breitbart and Glenn Beck's The Blaze. This echo chamber has wielded extraordinary influence on the Republican party, pulling it further to the right and helping to unseat moderate voices in the House and Senate. Now, Trump appears to have brought the echo-chamber's influence to its apotheosis: The outside media influencers are on the inside, driving his media strategy through formal channels (in the case of Bannon) and informal channels (in the case of Ailes). The people who laid the foundation for Trump's success are now helping to call the shots. "Talk radio, Fox News and the conservative web sites created space for an outsider like Trump to storm the GOP citadel," Nicholas Kristof, the New York Times columnist, told CNNMoney. "Now Trump, having tried -- not very hard -- to kiss and make up with the GOP establishment seems to be reverting to the media guerrillas who initially gave him the microphone and the push he needed." 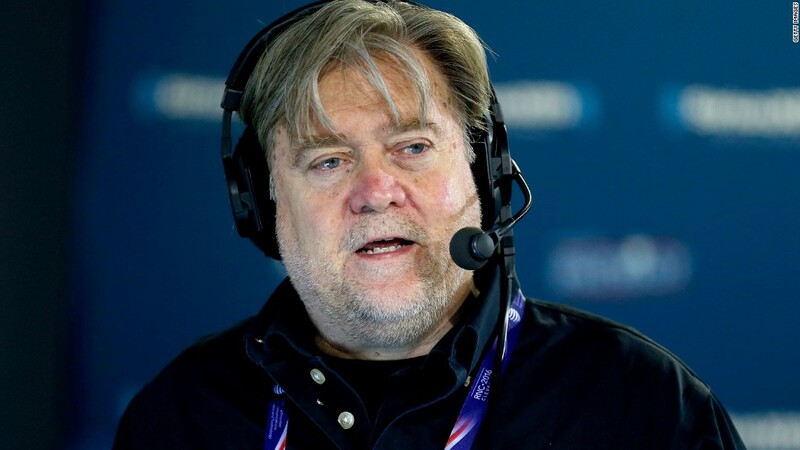 Stephen Hayes, a columnist at the more establishment conservative Weekly Standard, wrote Wednesday that in hiring Bannon, Trump "is choosing to end his campaign living in the alternate reality that Breitbart creates for him on a daily basis—where everything he does is the best, where everyone who questions him is an idiot or a traitor... and where, truly, Trump alone can fix it all." William Kristol, the Weekly Standard's editor, told CNNMoney: "The gulf between talk radio/Breitbart/Hannity and The Weekly Standard/National Review... is pretty striking." Breitbart News, which was founded in 2007 by the late Andrew Breitbart, has in 2016 became a reliably pro-Trump network that views journalism more as partisan warfare than public good. Making no apologies for its conservative, populist worldview, it promotes anti-establishment Republicans, attacks liberal and establishment opponents and often traffics in conspiracy theories about President Barack Obama, Hillary Clinton and other Democrats -- as well as some Republicans it views as the enemy. In that regard, Bannon's Breitbart is very much like Trump himself: Combative and unapologetic. In a statement Wednesday, Breitbart CEO and publisher Larry Solov said Bannon would "perform brilliantly" in his new role as Trump campaign CEO. The conflation of Trump's campaign with a certain segment of the right-wing media that has buoyed his campaign was not lost on political journalists. "Fox News, Rush Limbaugh and Drudge Report have held inordinate power in the GOP for years," said Mark Leibovich, the Times Magazine's chief national correspondent. "In a sense, Trump has allowed for a more honest acknowledgment of that." Trump's decision to rely on influential right-wing media players indicates that, far from tacking toward the center, he intends to make an even more aggressive appeal to the far-right, populist wing of the party that reads Breitbart News and watches Fox News. Like the news organization he ran until joining the Trump campaign, Bannon is known as a hard-right provocateur who takes a no-holds-barred approach when dealing with political enemies. Under his watch, Breitbart has boosted Trump, attacked his opponents and defended him during controversies -- even when one of those controversies was about allegations that Trump's then campaign manager, Corey Lewandowski, had manhandled a Breitbart reporter. At Fox News, Ailes similarly gave Trump a platform to push his talking points and limited critical coverage of his campaign. Fox News host Sean Hannity, a self-described Trump supporter, has frequently hosted the candidate on his show -- often for the full hour -- and given him free rein to address supporters unchallenged. While other Fox News hosts were more critical of Trump, no television outlet provided him with more cover. But winning over an audience of passionate conservative viewers is much different from winning enough voters to secure the White House, and many observers believe Trump has made an error in relying on the likes of Bannon and Ailes. "What it portends it is an even more brutal fall campaign," said David Axelrod, the chief strategist on Barack Obama's 2008 and 2012 presidential campaigns. "These guys are pugilists, which will only reenforce Trump's own instincts." "By turning to Roger Ailes and Steve Bannon, he has surrounded himself with upstarts who are are expert at feeding his proclivity for being provocative, but not necessarily in get-out-the-vote campaigns in Pennsylvania," said Kristof. Hillary Clinton's team is echoing, and pushing, these kinds of sentiments. On Wednesday, Clinton campaign manager Robby Mook said that in hiring Bannon, Trump "has decided to double down on his most small, nasty and divisive instincts by turning his campaign over to someone who is best known for running a so called news sites that peddles divisive, at times, racist, anti-Muslim, anti-Semitic, conspiracy theories." Trump's turn to media executives is also likely to fuel speculation that the candidate may be positioning himself for a future in conservative media after the campaign. In June, Vanity Fair reported that Trump was "considering creating his own media business, built on the audience that has supported him thus far in his bid to become the next president of the United States." "According to several people briefed on the discussions, the presumptive Republican nominee is examining the opportunity presented by the 'audience' currently supporting him," Vanity Fair's Sarah Ellison reported. "He has also discussed the possibility of launching a 'mini-media conglomerate' outside of his existing TV-production business, Trump Productions LLC." By bringing on Bannon and taking advice from Ailes, Trump appears to have decided that it is smarter to double-down on his populist rhetoric and rev up a base that, as Axelrod put it, "is not large enough" to carry him to the White House. But that is not necessarily a losing strategy if Trump's ultimate goal is to stake a claim on the right-wing echo chamber that has been so critical to his success. "I can't help wondering whether Trump may be thinking post-November of creating a media organization of some kind that caters to disgruntled white men of the kind who fueled his campaign," said Kristof, "and Ailes and Bannon could be a part of that braintrust as well."